Themes determine how the design of your blog will look to the outside world. Many themes also allow you to upload a header image of your choosing. It’s recommended that you choose a theme before you begin adding content to your blog since switching themes may change certain settings and widgets. From the Dashboard, select a theme by going to Appearance > Themes in the menu on the left, or choosing Themes from the Appearance menu in the Toolbar along the top of the screen. You can browse manually through the Themes menu, or you can Search Installed Themes or use the Feature Filter link to choose themes with particular colors, or features such as customizable header, two column, three column, etc. 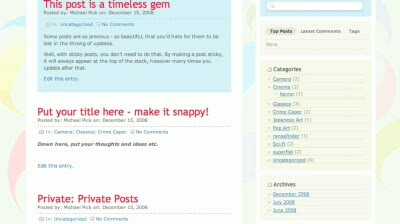 You can preview different themes to see what they will look like on your blog. Click on either the theme screenshot or the Preview link below the screenshot to see a full-screen preview of how that theme will look on your blog. If you like the theme and want to use it, click the Activate Theme link in the top right corner. If you don’t like it, or want to view others, click the x in the left corner to end the preview and return to the Themes menu. Many themes allow you to change the header image of your blog to something of your own choosing (look for themes with a “custom header”). If the theme you choose provides this option, you can access it under Appearance > Header or choosing Header from the Appearance menu in the Toolbar along the top of the screen. The screen that follows will provide you with instructions to upload a header image from your computer.